Like the Maxima Servo, Maxima G Servo offers reliability, precision, versatility, user-friendliness and energy-savings, but at higher tonnages. Starting at 1100 and going all the way up to 6600 tons, the all-electric machine provides up to 60% energy savings over similar machines, with a reduction in molding costs, heat load on the factory floor and maintenance costs. This high-value injection molding machine combines the advantage of a precise and accurate toggle mechanism with advanced user friendly-controls. Engineered for excellence, Maxima G Servo features high-temperature stability, a twin cylinder injection unit, standard barrel swivel and precise linear guideways. Its servo motor design provides improved repeatability and reduced energy consumption, and low operating noise. The servo system only delivers flow as it is needed, preventing unnecessary generation of heat and significantly reduces oil cooling requirements. The life of seals and hydraulic components are increased, oil life is enhanced, and radiated heat load on the factory is reduced. Single zero leak clamp cylinder design allows clamp tonnage to be checked in. The overall efficiency of the machine is significantly improved since zero energy is used to maintain clamp tonnage during machine operation. The MOSAIC Control is the high- performance control system that controls and communicates all machine functions and related parts producing processes. MOSAIC Control provides improved reliability, performance, and user- friendliness to keep your process in control. Individual forward and retract manual movement keys for each axis. Factory programmable buttons for added options. Logical grouping and separation of the machine function and manual operator keys. Swing-arm mount can be optimally positioned for each operator, allowing for an unobstructed view of the mold area. Screen layouts are clear, concise and easy to understand. Direct Group Access Keys for quick machine setup. Pop-up keyboards for data and text entry. Drop down selection boxes for choosing items from a list. Lighted On/Off buttons. Choice of Language and Units of Measurement. Status Bar at screen bottom provides a quick glance at the current status of critical machine parameters, including actual feedback from sensors, current cycle count and current logged-in user. Give your maintenance staff the ability to keep equipment operating at peak performance and your personnel more efficient ways to troubleshoot. Access all critical information about your plant equipment faster and easier from a laptop, tablet or online. 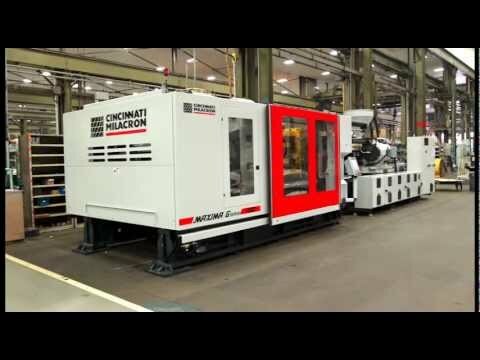 The closed-loop control considerably improves the cycle consistency and repeatability compared to a conventional hydraulic injection molding machine.